Successfully Added Dual Core LED Projector - Android 4.4 OS, 3200 Lumens, 1.4GHz Dual Core CPU, 1GB RAM, Wi-Fi Support to your Shopping Cart. This Dual Core LED Projector emits 3200 Lumens and has a Dual Core 1.4GHz CPU, Android 4.4 OS, 1G RAM and Wi-Fi Support so you will have everything needed to enjoy life size images. 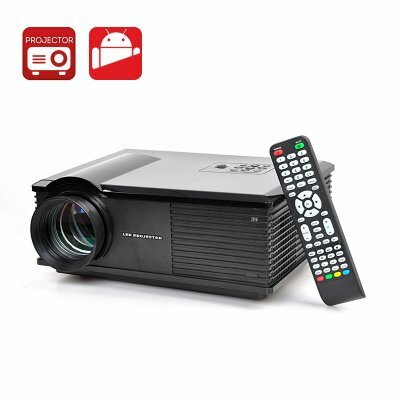 What better way to watch your favorite club or film with this stunning LCD projector. Grab a cold one and put your feet up and let this LED projector with its 3200 Lumens and 140W lamp, bring videos to life in your front room. The dual core 1.4GHz processor and 1GB of RAM provide an ample amount of power for you to watch film movies or even hook up your game console and enjoy some advanced gaming with a projected image from 30 to 150 inches at a range of between 2 to 5 meters, this LED projector can be used in your front room, bedroom or in the pub. You, your family, friends and even the nosy neighbors can enjoy this dual core Android 4.4 LED projector. You can use the pre-installed Android 4.4 operating system to access one of the most popular platforms and arguable the best in the world today. Download and install applications from the Google Play store by using the built-in Wi-Fi antenna to connect online, so you can update your Facebook, look at videos of cats or argue with strangers on forums, the possibilities are endless. This product is in stock now, we guarantee next working day shipping and offer a 12 months warranty on all our products. Brought to you by the leader in electronic devices and wholesale LED Projector, Chinavasion. Has done everything it suppose to so far (3weeks). The Android really tops it off. Enjoying my huge hd screen now, I call it my SmartWall lol. Thanks! !